Fearnhill School open day yesterday. Exciting I know, but when you have a Year 6 child you have to do the rounds. Sigh. Anyway - saw Hayley A in one room (erm... English? I dunno) which inspired me a bit. They had some PCs there with internet access. Guess what one or two of them were displaying by the time we left the room? No - those sort of sites are blocked. Well, I hope they are. And how could you think such a thing? What I meant was this website! I know. Terribly childish. But seize every opportunity to sell the team I say. And much more interesting than the Arsenal website that the previous user had pulled up. Probably the most comprehensive and up-to-date listing directory of women's rugby clubs can now be found here. It seems to be the private project of one man - Steve Uglow of Canterbury Rugby Club in Kent - and covers not just women's clubs, but al clubs across the country, as well as referees societies, governing bodies, and so on. He does - with the odd exception - limit himself to just adult clubs that play within a league structure. Indeed he actually says he does not include student or school sides. With one apparent exception. Just one. Us. Yep - it would appear that - of 100 or more junior girls teams in the country - only Letchworth Girls' is worth including on Steve's website. I'm ever so slightly touched by that. Not to say chuffed and rather pleased. Anyway if ever idlly wandering the web and want to get a flavour of the adult game, or if someone should ever suggest that women's rugby isn't a significant sport, go over to Steve's page and take a look at how many clubs there are across the country. Just discovered that our opponents on Sunday have a blog too - see http://madkows.vnworks.net/. Anyway, drop by the site some time and check them out! As we now move towards our first fixture I have decided that we need to get our preperation spot on. One of the key things within this to work together as a team from the moment we meet in letchworth. Changing rooms will be available and you will find your match shirt along with a warm up shirt on your peg when you arrive at the changing rooms. Those girls that comply with the new dress code on Sunday will be awarded2 bonus points for your player of the season total. A reminder that an away game is already worth 2 points so that 4 points for just turning up before youve even touched a ball. Any problems or questions please ask especially if you dont have part of the dress code ust tell me so that i know and we can sort out a suitable alternative. Kick-off on Sunday will be 1pm, so - for those travelling from Letchworth - we will meet at Sainsbury's at 11.15. If you are travelling direct please let us know. Milton Keynes have also confirmed that there will be access to full changing room and shower facilities. Propects are looking good for at least one fixture with Thomas Becket School, Northampton this season. Various options are being investigated, including their joining us for our fixtures at Ampthill or Kettering, as well as possibly coming down to us when Kettering visit us (for what would then become a four-way "East Midlands challenge"). There is even a chance that they might visit us for a mid-week fixture in the spring when we start the U11 girls tag as Thomas Becket also have a U12 girls tag team. They are also entering the National Cup, so we could well meet them in that as well. Apparently they have close to 30 girls at U17 this season, and a dozen or so U14s. Ok, so after training on Sunday I am very impressed with the progress that the under 14's are making. Particularly as for most of the girls this is their first full season. Directions for Milton Keynes are below. Unfortunatly I may not be at training on Wed as I have a training course, however there I will be setting work for another coach to take the session. However I do need all the girls to be regestered with the club and RFU before the game to ensure you are all insured. The next few weeks are going to be busy, as we have a number of matches and tournaments planned. Please can you let me know as soon as possible if you can not make any of the games. New supplies of the "official" team hoodie are now available in the club shop. This unique item of kit (essential when it gets starts getting a bit colder) - here "expertly" modelled by Nichola and Hayley - was worn by everyone throughout last season, which is why one or two may now need replacing! 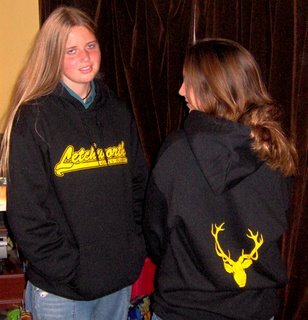 Created for us by by the designers at Tackle Girls - an international women's and girls' rugby website (and well worth a browse, especially wth Christmas coming up) - the top quality garment can be bought for only £20 at at the club shop (open every Sunday morning). The names of the Hertfordshire's backs have now been announced and two more of our girls have been selected. ... and there may be more yet as there is still room for other names to be added from those who couldn't make trials. But congratulations to Rosie and Natalie. Rosie in particular played out of her socks last Sunday (see above!) 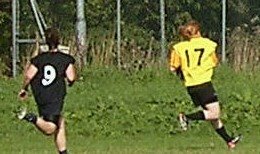 and deserves recognition for the effort she put in, while Natalie (racing away to score in typical style, below) is one of only five girls from last season county U14s to make this season's county U17s. It also means that we have gone from having two girls in the U17 squad last season to five this time round! And the third county cap? Sasha Acheson - who we hear may well be the captain of the newly-formed Eastern Counties U17s. Sorry lots to cover here. Its all very important so please make sure you read it all. Sunday please meet 10:15 so that we can start by 10:30!!! The next few training sessions (Sunday and Wednesday) are vital as we are now starting to finalise combinations ahead of our first fixtures. Remember the only way you can stake your place for a starting place is by showing us what you can do at training. As usual please let me know if you cant attend by return email. John has been very efficient and has already posted directions below!!!!!!! Times to be confirmed next week. It is unlikely we will be able to meet at the club in the morning as the mini's have a tournament. Meet place that morning is likely to be the back of Sainsburys car park, or somewhere similar. Again this will be confirmed next week. This is a hugely important fixture as it is our one and only chance to test our game plan in a match situation before going to Beckenham on the 8th. Please let me know ASAP if you cant attend this fixture as we are now starting to finalise team plans and combinations. If you are struggling with lifts please let myself or John know I'm sure we will be able to sort something out. Directions should be finding there way onto this blog early next week. No leave time as yet but likely to be an early start. Meet time at Beckenham most probably to be 10:00 so I hope all your alarm clocks are working. I hope those that were at the county trials on Sunday realise how lucky we are to have the numbers and the quality we do in our squad and we should go to Beckenham with high hopes. The tournamnet itself is hugely important as it is our first chance to compete for some silverware this season and show evrybody else what we're made of. Again please let me know ASAP if you cant attend this tournament as we again are starting to finalise the likely strating team. We hope to take all of you in the squad as there are 19 of you and the max. squad size is 20. For those of you that are still yet to register please email me for a membership form. Membership must be paid before the MK game otherwise you will not be able to be play. By my reconing thee are still 6 to register. If you are unsure wether you have registered please ask dont asume you have. Finally I send the my personal congratulations to the three forwards that were announced today that have made the herts county squad. Well done to Nim, Hayley and Laura. Backs have yet to be announced so keep your fingers crossed. So well done to those three - and particular congratulations to Laura as one of only two forwards from last season's U14 county squad who have been selected for this season's U17s. All three will now have county training sessions on three Wednesday evenings (including this coming Wednesday) in addition to the development days in October and November. Details are here. For the other seven of you it is still intended to form a county "B" squad - so the development Sundays in October and November will still be important. The main reason for the delay in announcing the names of the backs is that not all of them were there last Sunday - in particular Katie and Steph, who the county backs coach is intending to see in action shortly. Or so last Sunday's World Cup Final has been called. I know we lost, but its still well worth watching - the England forwards were incredible, but the New Zealand backs astounding. If you'd like to borrow a DVD of the match please let me know, and if you want you own copy to keep give me a blank recordable DVD this weekend. A reminder that training is tonight at the new later time of 6:50. We've got lots to go through especially little bits and pieces that myself and John picked up at the weekend. Lets have a good turnout please. I'll be there setting up from about 6:30 if any of you want to get there really early. We should finish about 8:10. Aye, I know it be bit late an all, but I''e bin bit busy and mightily forgaret thaht 'tis Int'rnashnul Talk Like A Pirate Day! Argh! Clearly such nahn'port'nt day carnt g'bee wiraht bein' marked in some way. So this be it. A-haaaarrrrr! Anyway - ti' trainin' tomorree, usual times (six of the clock for ye under-f'rteens and se'en for under se'enteens). See 'ee there! The symptoms of this complaint are a tendency to behave as if your boots have been filled with lead and your hands covered by butter-covered concrete whenever someone hoves into view wearing a purple shirt. The total shut down of all higher brain functions also seems to take place in some cases. Truth is that - while good - they ain't THAT good. At least one of the Welwyn girls yesterday had never, ever played a game of rugby before and half of the rest were last year's U14s. I would actually venture to suggest that had they been wearing different shirts and called themselves "Tunbridge Wells" or something the result might have been a shade different. We might maybe still have lost, but equaly we just might have managed to catch at least one restart and even got into the other half of the field. However, there is hope. After all we proved in the first game that the we have now finally found a cure to the related problem called "Oh heck its Hertford!". And if we do sort the former problem out then in March we can maybe look forward to applying the solution to our other remaining complaint - "B! @~ 'ell, its Basildon!". The final free date in the fixture list is now closed off as on 4th March we will now be playing Basildon (well, Basildon & Rochford as they have combined for the season I gather). Hopefully this will be at home as they have no objection to travelling - but we still have to check on pitch availability for that day. If you have Sky then set your videos / DVDs / whatever - or be prepared for a blearly start to the week - because the World Cup Final between England and New Zealand will be on Sky Sports 3 live from 11.55pm on Sunday night. So not exactly a huge build-up to the game anticipated being as it starts at midnight, but even so its good to see. The semi-finals also went out on Sky last night - 24 hours after the matches actually took place, but broadcast "as live" so you saw the entire games. Basically it seems to be the same coverage as the 24.7 internet broadcasts - Sky have not gone to the trouble of actually having reporters out there or anything. Both teams should be fully up-to-strength and England seem confident that they can steal it. So remember to tune in - could be a memorable night! The final significant hole in the fixture list (in more ways that one) has been filled with the addition of a game away to local friends and rivals - Welwyn - on 17th December. At present this will be a game for U17s only as Rachel is currently not sure that our new U14s are ready for the sort of challenge that Welwyn can provide! It may be possible for squeeze one more game into the lists in March - but we'll hold that open for now in case we have to move fixtures due to cup results, or other events. The sixth county newsletter - and the first of the new season - has been published. The latest edition headlines the trials and development day at Stevenage on 17th, but also includes a summary of the main news items of the summer and a diary of key dates for the season and a contact listing of county coaches and managers. Also now available is the registration form for the county day. Every player attending the day must arrive with a completed form as it provides important information for the organisers as well as essential parental permissions. A few of you were loyally suggesting tonight that you wanted to put your club before county or region this season. While that is all very noble, team spirited and so on its worth considering a few points before making the selfless sacrifice. There are no clashes between any county training or match days and anything the club is doing. By taking part in county activities you will miss nothing at club level - not least because all you coaches are, or are likely to be, involved with the county teams so there will be nothing going on at the club on county days! Equally with the Region there will only club training on regional days as there will be virtually no-one to play even if we wanted to. Any matches that may be will be inter-county games, like the tournament in Wimbledon last season. So again by going to region you miss nothing at club level. The awesome performances in training over the past couple of Wednesdays (especially tonight) also means that frankly any or all of you are quite capable of getting selected by county! County trials is by way of a "tournament" and you will be playing as Letchworth. Not only will this be a good dry run for Beckenham, but it will be a great opportunity to play other Herts teams, espcially those who do not currently appear on the fixture list. Your involvement at county or region means you will play at a higher level, will work with some different coaches, and will come back better players. That clearly happened with those who played at county and regional level last year. And if you are better players the club obviously benefits! We also have targets, as a team and club, which are performance related and county/regional selection is a ley part of that. Or in other words the club (and therefore the team) has a major stake in getting as many of you into the county and regional teams as possible! If you miss out trialling this year you will risk missing out next year as well. Due to age band changes this season's squads will run on more or less unchanged into next season. So if you were thinking of not going to county or regional trials this year - think again! In the end we want you to play county and regional rugby. You are ALL quite capable of making that step up, and the club (and you) will benefit far more by your taking part in representative rugby than it ever could will if you stayed away. The Under 17s will now train on a Wednesday night starting at 7:00, so please arrive at 6:50. Training will finish at 8:10 so please inform parents pick up is 8:15. Sorry about all previous confusion. This training change will take place as off next week the 13th of September. Training will be at the usual time of 10:30 on Sunday. Please arrive 10mins early. I cant be there but John and Mike will be taking the session, and are likely to cover some of the same stuff we did this evening. Finally thank you for a brilliant session tonight a lot of good work all round. Midweek training: U17s time change, U14s no change! After long discussions and consultations and so on we have now agreed with the rest of the club that the U14s will continue to train from 6pm to 7pm, and the U17s will train from 7pm to 8.10pm, both on Wednesdays. The boys will be training from 6 to 7.15, so there will be a slight overlap with the U17s - but we'll just be warming up then so it won't be a major issue. The U14s are also currently a small group so until numbers grow again it isn't a major problem. One benefit from this is that the U17s have the entire training pitch to themselves from 7.15 to 8.00 (or indeed as long as it is wanted! ), so although we will be finish 30 minutes later than last season the positives in the end outweigh everything else. Things are likely to get even more difficult next season... but that is still along way off yet. 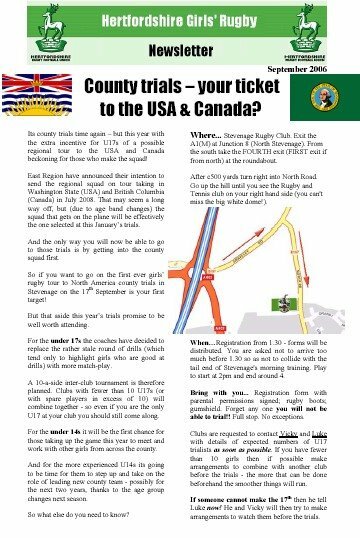 If you are a U17 then about 7,000 miles... or the west coast of the USA to be exact! If you need an incentive to get into the county or regional team then how about being part of the first ever girls' rugby tour of the USA and Canada? Today it has been announced that the RFUW have given permission for the official East Region's girls' U18 squad to take visit North America in July 2008. It will be the U18 squad because, as you will remember, age bands change next season. This means that it will effectively be the same as the U17 squad that is selected this season. Ideas in the ambitious plan includes possible participation in a USA's West Coast championship (to be held in Washington State) or a similar inter-state tournament to be followed by games with at least one Canadian provincial team. The tour will take place in July 2008 as this best co-incides with both the US and Canadian seasons. And - of course - the first stage in selection for the tour will be the county trials in Stevenage on the 17th - because "closed" regional trails mean that if you are not in a county squad its unlikely you'll make the regional squad. Why North America? Because girls' rugby is a a BIG thing over there Â a quarter of all American rugby players are women, and the attitude to the female game in the USA in particular seems to be hugely positive. East can expect a warm welcome, with plenty of top quality rugby in two different countries. Clearly there will be a lot to do before then. Such tours are not "free" and there is a great deal of planning to do. But with the better part of two years to plan and fund raise for the trip it should be a event that you will remember forever. As for the U14s the problem we face is that there is not the range of opposition available for the younger age group. This is also a huge step into the unknown, so we need to get it right. And if do and all goes well then we can expect future tours to follow - in both direction. So the intention is that you will get a chance - next time! Can you spare a minute to write a message to the BBC? If you check on the BBC sport pages you will find on the main football page (http://news.bbc.co.uk/sport1/hi/football/default.stm ) there is a permanent link to a permanent index page of news about women's football. On the main cricket page (http://news.bbc.co.uk/sport1/hi/cricket/default.stm) there is ALSO a permanent link to a page of news about women's cricket, and today there is even - highlighted with a photograph - a review of the women's test series. And the same applies to tennis. And golf. In fact I could probably carry on down the list of major sports and in every case where there is significant and separate women's participation there is a permanent link to a permanent page of news about the women's game. Okay for the period of the women's world cup they have a small index buried in the bottom right hand corner of the screen. But this will disappear when the world cup finishes, thus again wiping all mention of the women's rugby off probably the busiest general rugby news webpage anywhere. Does it matter? Yes! If the BBC (of all people) don't cover the game, who will? Coverage brings in interest which brings in sponsors and funding. It also attracts more players and it also means that people (well, lets be honest here, men) in the game are more likely to (eventually) take the women's game more seriously. At the moment we are all but invisible - and it shows.